On Friday, September 22 at 7pm, please join me, Spec’s fine wine buyer Bear Dalton, in welcoming our always-entertaining-and-ever-informative friend Jane Ferrari, traveling winemaker of Yalumba, to the Wine School at l’Alliance Française for a tasting of Yalumba’s excellent Australian wines. The net proceeds of this event will benefit ECHOS (see below). 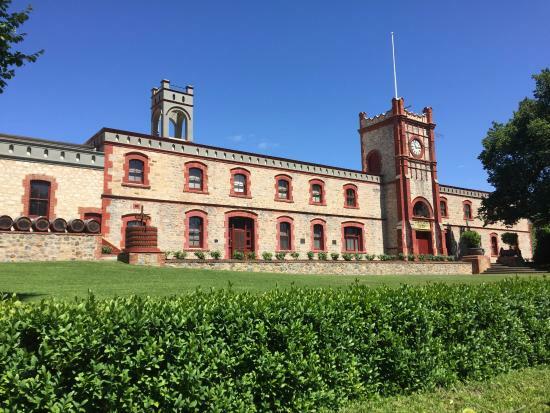 The ever-popular Ms. Ferrari will talk about where the wines come from and how they are made as well as the history and traditions of both Yalumba and the Barossa Valley. A native of Australia’s acclaimed Barossa Valley, Jane Ferrari is a trained winemaker – a graduate of Australia’s Roseworthy College (one of the top three winemaking schools in the world) – who gets her hands dirty both in the vineyards and the wineries in Barossa but also travels the world telling the Yalumba story. She is down-to-earth and very entertaining in a way that must be experienced. Jane first visited Houston in October of 2003 and utterly charmed a group of over 60 wine fans. She has been back almost every year since and has wowed us all each time. In addition to information about wine, you may hear about Australian and American culture (or lack thereof), Baseball, Elvis, and other tangentially related topics. An Evening With Jane Ferrari will cost $30.00 (Cash or Check made out to the ECHOS only please). The class will meet at 7pm on Friday September 22, 2017. To reserve your spot for this event, please contact Susan Coburn at 713-854-7855 or coburnsusan2@gmail.com. Epiphany Community Health Outreach Services (ECHOS) is a non-profit organization connecting people in need with the health, social and educational resources that can improve their lives. ECHOS’ mission is to connect people in need with health, social and educational resources that can improve their lives. ECHOS provides on-site help to families who are unable to access affordable health care and who do not have medical insurance coverage in completing and submitting applications for healthcare and social services. ECHOS also assistclients in meeting basic needs and self-sufficiency. Assistance is free and includes: Food from the Food Pantry, Food Fairs and Mini Health Fairs, English-as-a-second-language, Computer literacy, and Domestic violence support groups on campus. ECHOS is a non-profit 501(C)3 corporation. On Tuesday, November 26th at 7pm, please join me, SPEC’s fine wine buyer Bear Dalton, in welcoming Yalumba’s famed traveling winemaker, the ever popular Jane Ferrari to Houston at l’Alliance Française for a tasting and class featuring eleven wines of Yalumba. The informative and entertaining Ms. Ferrari, who is a native of Barossa, will talk about where the wines come from and how they are made as well as the history and traditions of both Yalumba and the Barossa Valley. Jane Ferrari is a trained winemaker (educated at Australia’s esteemed Roseworthy College) who gets her hands dirty both in the vineyards and the wineries in Barossa but also travels the world telling the Yalumba story. She is down to earth and very entertaining in a way that must be experienced. Jane first visited Houston in October of 2003 and utterly charmed a group of over 60 wine fans. She has been back almost every year since and has “wowed” us all each time. In addition to information about wine, you may hear about Australian and American culture (or lack thereof), Baseball, Elvis, and only Jane knows what else. BAROSSA AND BEYOND with Jane Ferrari will cost $30 per person cash ($31.58 regular). The event will be held at l’Alliance Française which is located at 427 Lovett Blvd. (The corner of Lovett and Whitney is a block south of Westheimer and two blocks east of Montrose.) To register for this class, please call Marlo Ammons at 832-660-0250 or send her a note at MarloAmmons@specsonline.com. A portion of the proceeds will be donated to the Houston Area Women’s Center. So this is almost Champagne Friday. Almost because it was Friday when I tasted the wine but it is now the wee hours of Saturday as I finish this post. And almost because the wine is sparkling wine from Tasmania rather than Champagne (but it might take a really good Master of Wine to figure that out in a blind tasting). Here’s the deal: I didn’t have a late Friday appointment in my office this week (the normal source for Champagne Friday), and I was quite late at the office. So to make it up to the lovely Miss Carol, we took a bottle of JANSZ Brut NV and a bottle of Girard Artistry 2008 (which I will most likely get to in another post) and went to La Vista (one of our favorite BYOBs) . Jansz is one of my very favorite non-Champagne bubblies. The winery is owned by the Hill Smith family who also own Yalamba. 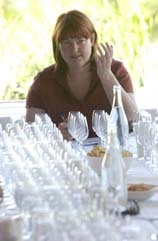 The winemaker, Natalie Fryar (that’s her in the picture), has been there since 2001 and before that she had five years of sparkling winemaking experience at Seppelt’s Great Western. As Tasmania – surrounded as it is by cold water – has one of the coolest climates of any new world wine region, it is ideal for growing sparkling wine grapes. I should probably mention that my friends David Maib of Negoçiants USA and Jane Ferrari who is the “traveling winemaker” for Yalumba are the ones who, some years back, introduced me to Jansz. Back to the present: While waiting for a table, we popped the Jansz. Not long after we said “Cheers.”, Miss Carol said “Yum!” That should do it but I will nevertheless offer my more detailed note below. Perhaps I should also mention that we drank the Jansz out of Riedel “Grand Cru Riesling” glasses which are rapidly becoming a favorite for richer sparkling wines.